Ever wonder where world-changing ideas come from? They are all what author Joshua Wolf Shenk calls creative pairs—pairs whose clashing beliefs, styles, and idiosyncrasies spur them on to imagine possibilities no one else before could fathom. If you're interested in better understanding the secrets to world-changing ideas—and how they can impact everyone’s day-to-day creative lives—join us at New Profit on September 11th at 5:00pm for a conversation with Josh facilitated by New Profit senior partner, Diana M. Smith, author of The Elephant in the Room. To learn more about Josh's work, see his cover story in this month's issue of The Atlantic, or David Brooks' column in The New York Times. Josh is the author of the acclaimed Lincoln's Melancholy and The Atlantic's most highly circulated article "What Makes Us Happy?" 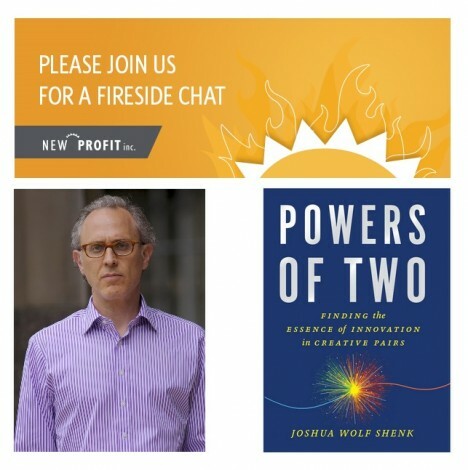 His latest book is The Powers of Two: Finding the Essence of Innovation in Creative Pairs. Copies of The Power of Two will be available for purchase. Please bring a picture ID for security desk.